On definitions: The history of chemistry is strewn with names that were once hotly contested and disputed by various protagonists and why do chemists fight over names so much, good question. On the origin of life : did life on earth become water-based because the hydrogen bond was the only interaction of choice to facilitate life? So what is the problem with these hydrogen bonds. Strong hydrogen bonds or hydrogen bridges found in O-H--O-R configurations pose no problem. Problems arise with weaker bonds, not always possible or difficult to detect it experimentally More disagreement: in the original Pauling definition and later IUPAC definition Y and Z are both electronegative as in R-O-H...O-R (electropositive hydrogen partners with two electronegative partners) while in an scenario with C-H...O=C-R the carbon atom is electronegative and the oxygen atom electronegative. So not a hydrogen bond then? An elite team of IUPAC chemists of which Desiraju was part of have now decided on the future of the hydrogen bond. 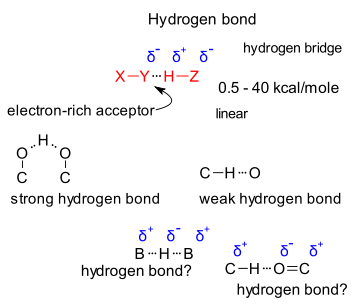 In a new definition the hydrogen bond is an attractive interaction between a hydrogen atom from a molecule or a molecular fragment X-H in which X is more electronegative than H, and an atom or a group of atoms in the same or a different molecule, in which there is evidence of bond formation. So far so good. The definition goes on with the evidence for hydrogen-bond formation may be experimental or theoretical, or ideally, a combination of both. Here Desiraju stresses that theory and experiment have equal status which may come as a surprise to those who believe in the ancient scientific principle that theories are validated by experiment. The new definition also stipulates that the actual bridge is formed by Y-H but if Desiraju has had his way the bridge would be formed by all 4 atoms in X-Y-H-Z. The X to Y distance no longer needs to be smaller than the sum of the van der Waals radii of X and Y: the precision of X-ray analysis does not allow it.